As our Gala date nears on May 10, 2012, we've been gathering beautiful items to include in our silent auction! We're sharing a few items here, and we invite you to bid for these beautiful accessories from all over the world at our gala event next month! RSVP for our Gala here. These beautiful earrings are from Monterrey, Mexico. The delicate sterling filigree compliments the beautiful coral stonework. The famed Yucatan peninsula is host to large coral reefs and is inspiration for this beautiful set of earrings. LitWorld works with the American School Foundation of Monterrey in Monterrey, Mexico. ASFM hosted one of the largest World Read Aloud Day 2012 celebrations with their elementary and middle schools. Beading is a local craft in Kenya, and these three hand beaded items are unique in every way. The collection includes a necklace, bracelet and bowl, and each piece is one of a kind. LitWorld's global hub site is located in Kenya, where we work with our partners at Columbia University's Millienium Cities Initiative to establish Girls' LitClubs to empower young women to change the world with their words. Capiz is a province of the Philippines in the Western Visayas region. The province is known for its elegant capiz shell products. 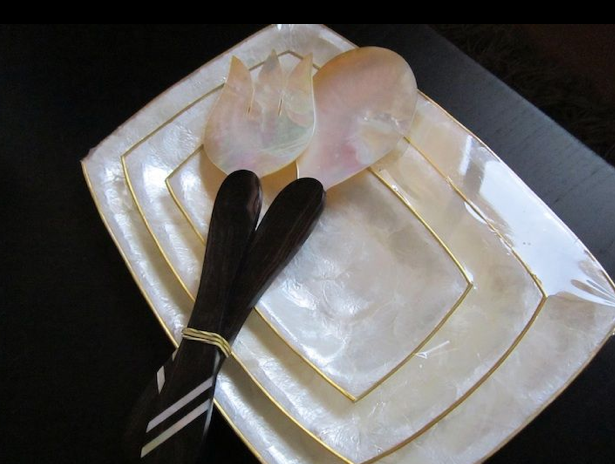 The Capiz Shell Collection includes wall decor, set of plates, mother of pearl salad fork and spoon, and flower candle holders. LitCorps Ambassador Ruby Veridiano has spent the past year living in the Philippines developing LitClubs in the country. Through your help, we can launch twenty new LitClubs across the world! Learn more about the Silent Auction here. Older PostPam Allyn at the World Literacy Summit in Oxford, UK!